Hypertension, untreated or insufficiently treated, is the most important cause of left ventricular hypertrophy, coronary heart disease, myocardial infarction, arrhythmias, and eventually cardiac failure whether left ventricular ejection fraction is reduced or preserved. Angiotensin-converting enzyme inhibitors or angiotensin receptor blockers, beta-blockers, and mineralocorticoid receptor antagonists (aldosterone antagonists) are cornerstones in the treatment of both patients with heart failure with reduced ejection fraction and high-risk hypertension as these drug classes lower morbidity and mortality. These drugs as well as calcium antagonists can safely be used in patients with preserved ejection fraction though no drug class has been shown specifically to lower mortality. 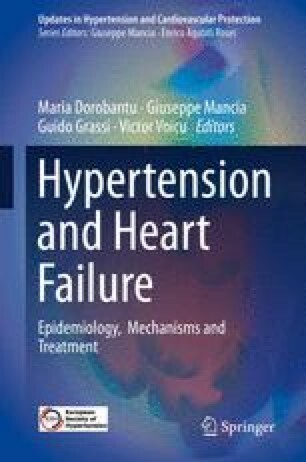 Diuretic treatment is generally considered a symptomatic treatment in heart failure patients but is needed in high-risk hypertension to control the high blood pressure and prevent complications. However, for primary prevention of heart failure in hypertensive patients, the various drug classes appear equally effective.